North America's first ever professional rugby union league is to be launched next year. The league, sanctioned by USA Rugby and World Rugby, will begin in April 2016 with six teams from the United States, before Canadian sides join in 2017. Each team will be allowed no more than five non-North American players. "As the fastest growing team sport in the USA, it is time to have a sanctioned professional competition," said USA Rugby chairman Bob Latham. 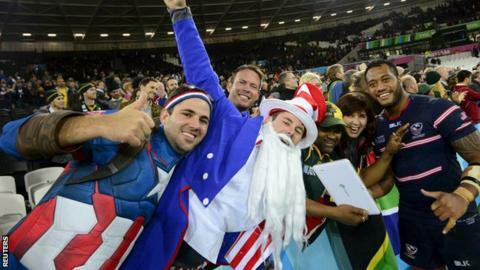 "We are very happy to partner with the Professional Rugby Organisation (Pro Rugby) in taking this step to popularise the game, to inspire Americans to fall in love with rugby, and to show the rugby world what American players can do." Pro Rugby, the organisation set up to run the competition, said the initial six teams would be based in the north-east United States, the Rocky Mountains and California. The US national team lost all four of its matches at this year's World Cup, finishing bottom of Pool B. Canada also lost all of their matches at the tournament, finishing bottom of Pool D.
Meanwhile, Premiership Rugby announced in October that London Irish will play their "home" match with champions Saracens in New York early next year - the first Premiership game to be staged overseas.